Part game, part social studies lesson with discussion prompts, this worthy sequel will leave fans eager for more. 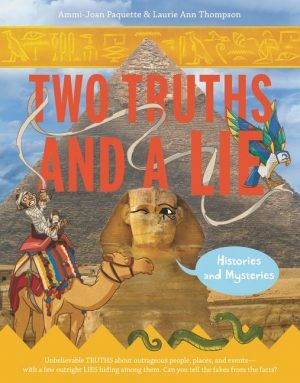 In this follow-up to their wildly popular book, Two Truths and a Lie: It’s Alive, authors Paquette and Thompson dive into the intriguing world of hoaxes, legends, and bizarre-but-true tales from history. Using the classic two truths and a lie format, every grouping of three anecdotes or stories includes two true tales and one false one. Can you spot the myths and outright lies? Rich with primary sources, photographs, and other text features, this series is an engaging and timely resource providing lively texts and a fun format for teaching children how to evaluate information for credibility and accuracy. 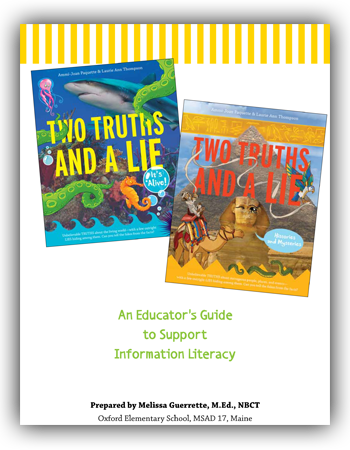 Click to download the Two Truths and a Lie Ed Guide, featuring activities for both the first and second books!